MARTINSVILLE, Va. – Brad Keselowski had sampled success at Martinsville Speedway, but had never put everything together to get to Victory Lane. He changed that on Sunday, passing Kyle Busch with 43 laps to go and pulling away to win for the 23rd time in his career. “It felt like we were due, and if you ever can be, this is one of those tracks and today was one of those days where we persevered in a special way,” Keselowski said. The victory came in team owner Roger Penske’s 1,000th start in NASCAR’s top series, and gave Ford its first victory on NASCAR’s oldest and smallest track since 2002. It also made Keselowski the first two-time winner this season, and was his fifth consecutive top-five finish. “This is one I’m never going to forget,” said Keselowski, who had been the runner-up twice in the past four races here. Keselowski or Busch led the last 160 laps and swapped the lead several times during a green flag run that began with 64 laps to go. Keselowski had the lead coming out of the 14th and final caution, but Busch quickly slipped underneath him to go back in front. Keselowski stalked him for 14 laps, the nose of his Ford inches from the rear bumper of Busch’s Toyota. When he finally got around Busch again, he gradually pulled away, opening a lead of nearly two seconds as Busch’s car, dominant for much of the day, faded. 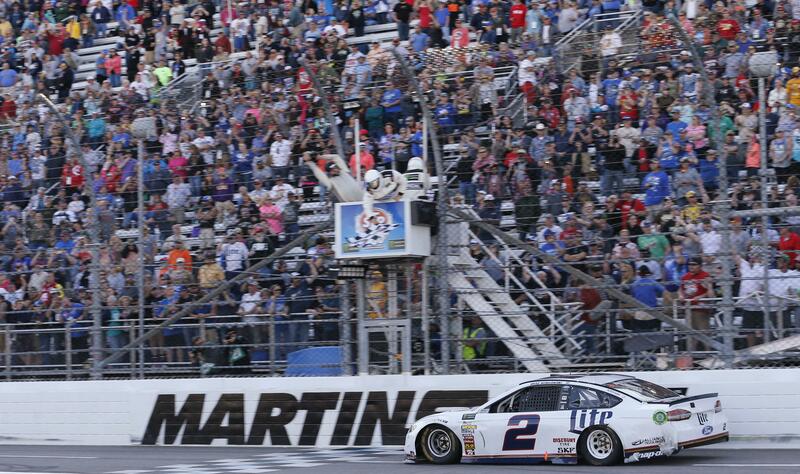 The lead paid off at the end when Keselowski had to navigate around lapped traffic. He won by 1.8 seconds. Busch led a race-high 274 laps and finished second, followed by Chase Elliott, Joey Logano and Austin Dillon. Martin Truex Jr. won the first stage in a three-lap sprint that featured lots of banging as drivers jostled to make the point-scoring top 10. Busch said he has no problem with being bumped, as long as Stenhouse knows to expect the same treatment in reverse. “I actually was rolling into Turn 3 and was kind of going higher out of the way and was going to let (Stenhouse) back by and give him the lap,” Busch said. POINTS: Even as the only multiple winner this year, and with five consecutive top-five finishes, Keselowski is just fourth in points. Kyle Larson, who finished 17th, leads by four over Elliott, and Truex is third, another 28 points behind. Keselowski trails Truex by just two points. BABY STEPS: Elliott insisted all weekend that he struggles mightily at Martinsville, but his performance for the weekend suggested he’s figuring it out. He won Saturday’s truck series race and got a playoff point in the second stage Sunday on his way to the third-place finish. “I hope that it wasn’t just a fluke deal and we didn’t just get lucky today and run good,” he said. SHORT DAY: Jamie McMurray arrived with a streak of five straight top-10 finishes and hopes of finally breaking through at Martinsville. Instead, he took a chance not fixing a tire rub under a green flag and crashed out after just 105 laps. UP NEXT: The series heads to repaved Texas, where most drivers will get their first look at the new surface in their first practice. Published: April 2, 2017, 5:50 p.m.